The development of endoscopic ultrasound was driven by the need to develop less invasive alternatives to surgical and radiologic interventions for a wide variety of gastrointestinal conditions. During the past decade, there has been a very rapid growth in the clinical role and capabilities of endoscopic ultrasound-guided therapeutic interventions. Endoscopic ultrasound offers both real-time imaging and access to structures within and adjacent to the gastrointestinal tract. The proximity of the gastrointestinal system to vascular structures throughout the abdomen and the mediastinum allows for endoscopic ultrasound-guided vascular access and therapy. The recent development of endoscopic ultrasound-guided vascular interventions has relied both on finding new applications for standard endoscopic accessories and on commandeering tools originally developed for use in interventional radiology. 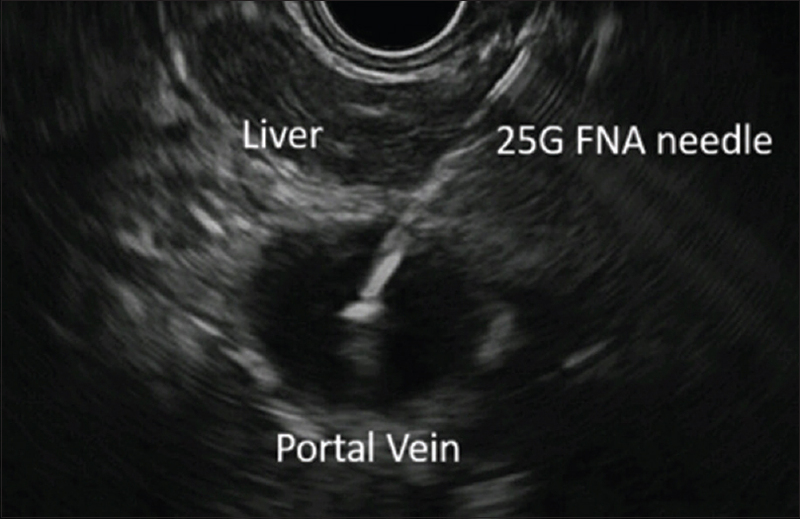 This article provides a review of the literature regarding the current state of endoscopic ultrasound for the management of variceal and nonvariceal bleeding, portal vein angiography and pressure measurements, intrahepatic portosystemic shunts, endoscopic ultrasound-guided fine-needle aspiration for portal vein sampling, drug administration and embolization as well as endoscopic ultrasound-guided cardiac access and treatment. Background: Tracking progress in diabetes care may help in evaluating the quality of efforts and identifying gaps in the care. 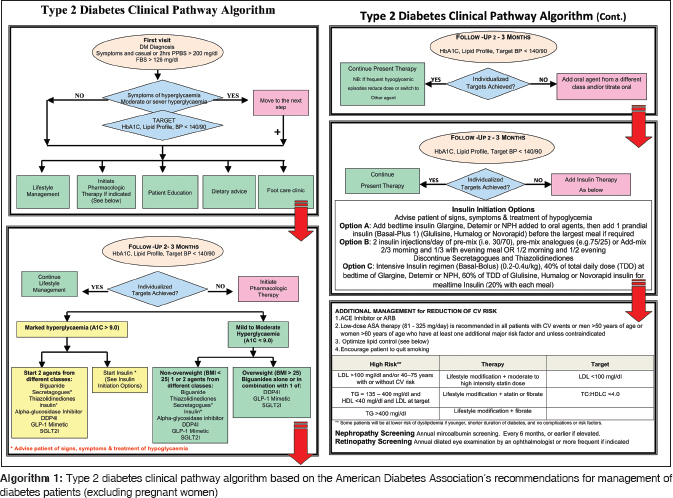 Objectives: To demonstrate that tracking important clinical indicators of diabetes mellitus can result in improved care as well as help identify and close gaps between evidence and practice in diabetes care. Subjects and Methods: The study is an observational, random audit of medical records of patients with diabetes who received care at the Diabetes Center, Dammam Medical Complex. Thirteen process and four outcome key performance indicators were studied using the quality improvement Plan–Do–Study–Act model, for the period between October 2012 and March 2016. Individual physician performance was also measured for the same duration. All data were benchmarked against peer organizations worldwide. Results: Urine examination for proteinuria, foot examination, annual influenza vaccination, aspirin prescription, structured education, personalized nutritional advice and self-monitoring of blood glucose significantly improved between baseline and the final observation of the study (P < 0.001). The proportion of patients with hemoglobin A1c >9% decreased, and that of those who achieved the recommended levels of hemoglobin A1c (<7%), low-density lipoprotein cholesterol (<2.6 mmol/L) and blood pressure (<140/90 mmHg) significantly increased (P < 0.001). Benchmarking against peer organizations worldwide showed comparable results overall, and better results for certain indicators. Conclusion: Quality improvement strategies and key performance indicators can be utilized to improve the quality of diabetes care delivered, and thus reduce gaps and barriers that exist between recommended diabetes care and practice. Background: Community water fluoridation is known to play a significant role in enhancing oral health by reducing the incidence of dental caries. However, the level of fluoride in the supplied public water in the Eastern Province of Saudi Arabia is unknown. Objective: To determine water fluoride levels at the main sources supplying water to households and schools in two major cities (Dammam and Al-Khobar) of the Eastern Province of Saudi Arabia. 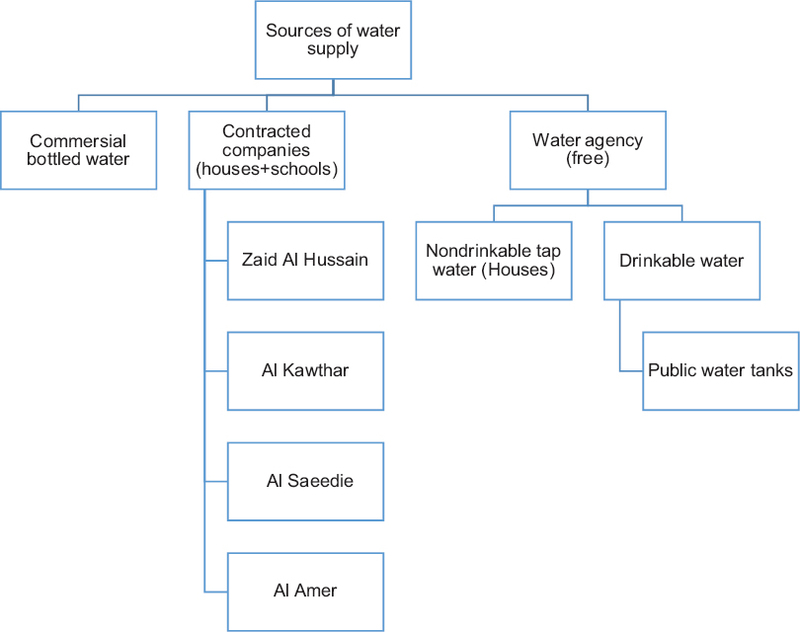 Methods: From the Directorate of Water Agency and Directorate of Education, the following were identified as the main sources of public water supply in Dammam and Al-Khobar: the water agency, public water tanks and four contracted companies. Two samples were collected from each of these six identified water sources at two different time points (in January and July 2016; 2 samples/site/time point; N = 24) using 500 mL polythene bottles. Each sample was analyzed using an ion chromatography system at different detection limits (including the lowest detection limit of 0.065 ppm) to determine the fluoride level. Results: There was no fluoride detected in any sample even at the lowest detection limit, indicating that fluoride levels in the studied water samples were <0.065 ppm. Conclusion: This study found that in the cities studied, fluoride levels, if any, are considerably below the optimum recommended level for the prevention of dental caries (i.e., 0.7 ppm). Background: Undergraduate learning is a sensitive and challenging period for students and has been reported to result in high rates of psychological distress in them. Objectives: To determine the prevalence of psychological distress among undergraduate students at Jazan University, Kingdom of Saudi Arabia. Materials and Methods: A cross-sectional study was conducted among a stratified sample of 500 undergraduate students from five faculties at Jazan University. All participants completed an anonymous, self-administered questionnaire, which included questions about their sociodemographic details and a measuring scale of general psychological distress, the Brief Symptom Inventory-18 (BSI-18). Results: A total of 450 students satisfactorily completed the questionnaire. Of these, 139 (30.9%) were screened positive for psychological distress based on the BSI-18 scale. Females scored significantly higher than males on the somatization (P = 0.002) and anxiety subscales (P = 0.006) as well as on the total symptom scale (the General Severity Index; P = 0.005). However, there was no significant difference between males and females regarding the depression subscale (P = 0.149). Twenty-eight students (6.2%) reported moderate to extreme levels of distress due to suicidal thoughts in the past 1 week before inclusion in this study. Conclusions: This study found that ~31% of undergraduate students at Jazan University are psychologically distressed. This finding necessitates the need for rigorous efforts to develop proper screening and intervention programs targeting this population. Background: Health education advocates regular dental visits to improve oral health. There is a need to verify the outcomes associated with various dental visits patterns. Objective: To assess the relationship of reported and clinically assessed oral health outcomes in Saudi children with their dental visits' pattern. Methods: This cross-sectional study included 6–12-year-old schoolchildren from six cities in the Eastern Province of Saudi Arabia in 2015. Parents responded to a questionnaire about dental visit patterns. Through a clinical examination, the presence of caries, sealants and need for referral was assessed. Univariate and multivariate regression was used to assess the association between dental visit patterns and pain in the past 6 months, presence of untreated caries and need for referral after controlling for confounders. Results: Of the 3000 questionnaires distributed, 2306 (76.9%) parents responded. Significantly higher odds of pain were associated with visiting when in dental pain (odds ratio = 6.81) and never visiting a dentist (odds ratio = 3.44), whereas significantly lower odds were associated with regular checkups (odds ratio = 0.28). No significant association was observed with visits after recall by dentists. Conclusion: Regular checkups initiated by parents are associated with better reported oral health outcomes in terms of pain, while recall by dentists has no impact on oral health. Background: Primary hyperparathyroidism due to parathyroid adenoma presenting with pancreatitis as the initial manifestation is rare. The causal relationship between pancreatitis and primary hyperparathyroidism is debatable. Objective: To study the clinical and biochemical profile of patients with parathyroid adenoma-associated pancreatitis as well as the outcome following parathyroidectomy. Methods: The authors retrospectively studied the clinical and biochemical parameters of patients with acute, recurrent acute and chronic pancreatitis who underwent parathyroidectomy for parathyroid adenoma at Asian Institute of Gastroenterology, Hyderabad, India, between April 2010 and June 2016. Results: Of the total 3962 patients who presented with recurrent acute and chronic pancreatitis, 77 (1.94%) patients had parathyroid adenoma-associated pancreatitis and were included in this study for further analysis. Of these, 41 (53.2%) had recurrent acute pancreatitis and 36 (46.8%) had chronic pancreatitis. Serum calcium (12.4 ± 1.7 mg/dl) and parathyroid hormone levels (367 ± 286.4 pg/ml) were found to be elevated. Left inferior parathyroid adenoma (37.7%) was the most common finding on neck imaging. Patients with chronic pancreatitis had a longer disease duration (3.8 ± 5 years) and more pain episodes (10.7 ± 10.2) than those with recurrent acute pancreatitis (0.62 ± 0.7 years and 2.6 ± 2.7, respectively) (P = 0.0001). 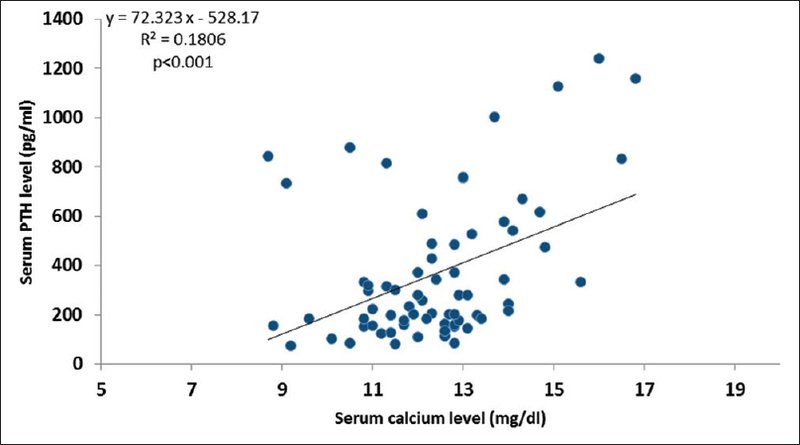 In all the patients, following parathyroidectomy, there was a significant decrease in serum calcium (12.4 ± 1.7 mg/dl vs. 9.7 ± 1.9 mg/dl; P = 0.0001) and serum parathyroid hormone levels (367 ± 286.4 pg/ml vs. 116.4 ± 47.1 pg/ml; P = 0.0001) as well as there was a reduction in the number of episodes and severity of pain. Conclusions: Estimating serum calcium after an episode of unexplained pancreatitis is important and can help minimize delay in diagnosing primary hyperparathyroidism, and possibly prevent the progression of pancreatitis. Parathyroidectomy improves the clinical outcome of primary hyperparathyroidism and prevents further attacks of pancreatitis. 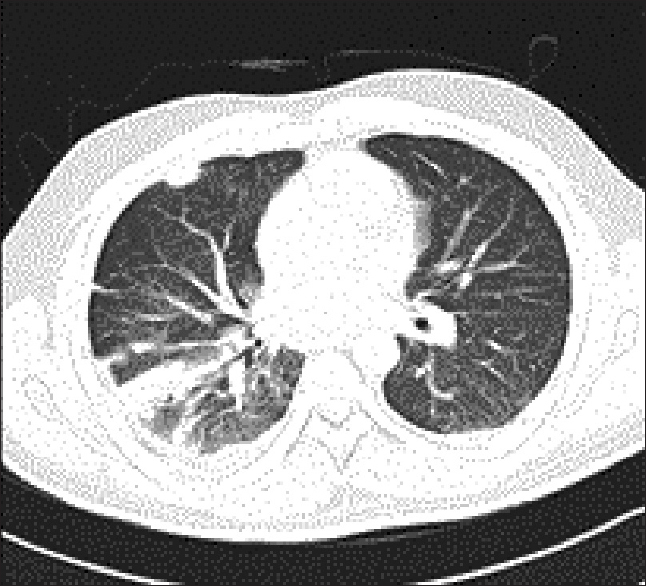 Background: The prevalence of primary spontaneous pneumothorax is high in the Arab region. There is a lack of studies from the Eastern Province of Saudi Arabia highlighting the associated risk factors and demonstrating the effectiveness of surgical management. Objectives: To identify risk factors associated with primary spontaneous pneumothorax and to correlate the effectiveness of surgical management with the rate of disease recurrence. 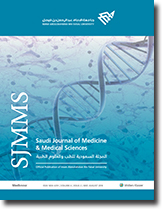 Subjects and Methods: This retrospective chart review included adult patients who presented with primary spontaneous pneumothorax and were managed at King Fahd Hospital of the University, Al-Khobar, Saudi Arabia, from January 1, 2005, to December 31, 2014. The results are presented as arithmetic mean for quantitative data, and chi-square test was used for statistical analysis. P ≤0.05 was considered statistically significant. Results: In total, 151 patients with primary spontaneous pneumothorax were included, with the majority being male (98.7%) and Saudis (88.7%). The mean age was 24 ± 6 years (range: 13–49 years), mean height 171 ± 8 cm (range: 144–193 cm) and mean body mass index 19.2 ± 3.8 kg/m2 (range: 13.3–39.0 kg/m2). About 62% of the patients were smokers. Ten patients had an ipsilateral recurrence of primary spontaneous pneumothorax after the first episode was successfully managed. Surgical exploration after the first episode itself was found to significantly reduce the recurrence rate. 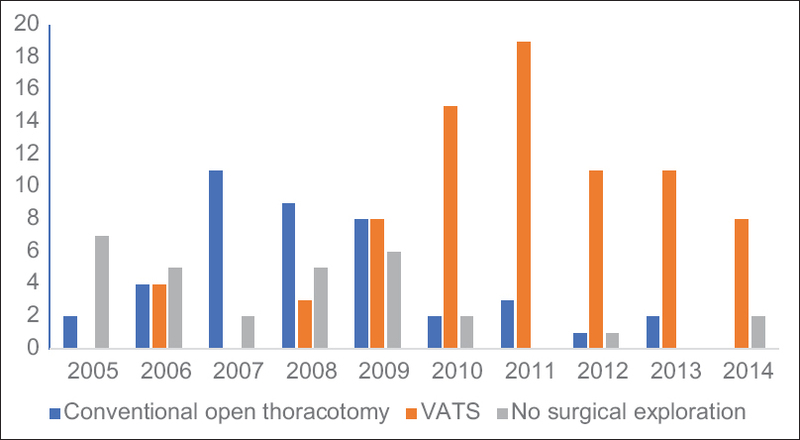 The study found that in the management of these patients, there was a shift from conventional open thoracotomy to the minimally invasive video-assisted thoracoscopic surgery method. Conclusions: The risk factors for primary spontaneous pneumothorax in this study were consistent with the current literature. Surgical exploration after the first episode of primary spontaneous pneumothorax significantly reduces the recurrence rate and there is a paradigm shift toward a less invasive surgical approach in managing these patients. Cutaneous polyarteritis nodosa (cPAN) is a rare type of cutaneous vasculitis. It affects the small- and medium-sized arteries of the dermis and subcutaneous tissue without extracutaneous involvement. The diagnosis is by skin biopsy, and the characteristic finding is a leukocytoclastic vasculitis. We report a case of a 14-year-old Saudi girl who was referred to the dermatology service because of multiple ulceronecrotic lesions on the frontal aspects of the distal lower limbs. She had past medical consultations and treatment but without improvement. The histopathology confirmed the clinical diagnosis of cPAN, and ultimately, she responded to treatment with pentoxifylline and topical clobetasol propionate. It is important to be aware of this disease and refer the patient to the dermatology service for the appropriate evaluation and treatment. Cutaneous polyarteritis nodosa is a rare type of cutaneous vasculitis. It affects the small- and medium-sized arteries of the dermis and subcutaneous tissue without extracutaneous involvement. The diagnosis is by skin biopsy, and the characteristic finding is a leukocytoclastic vasculitis. The authors report a case of a 14-year-old Saudi girl who was referred to the dermatology department because of multiple ulceronecrotic lesions on the frontal aspects of the distal lower limbs. She had past medical consultations and treatment, but without improvement. Histopathology confirmed the clinical diagnosis of cutaneous polyarteritis nodosa, and ultimately, she responded to treatment with pentoxifylline and topical clobetasol propionate. It is important to be aware of this disease and refer the patient to dermatologists for the appropriate evaluation and treatment. Melioidosis, an infectious disease caused by Burkholderia pseudomallei, is an important cause of sepsis in tropical areas of Eastern Asia, mainly affecting immunocompromised adults. Diabetes mellitus is the most important host risk factor. Here, we report a case of a 54-year-old Saudi male with uncontrolled diabetes mellitus for 10 years who presented to our hospital with a 6-week history of fever, cough, night sweats and weight loss. Definite diagnosis of melioidosis was not made because of insufficient facility to culture the organism in our laboratory; nevertheless, the diagnosis of melioidosis was made based on the cumulative clinical scenario. The patient was discharged with a prescription of trimethoprim–sulfamethoxazole and doxycycline for 3 months and showed dramatic improvement at follow-up. For prompt diagnosis and treatment, clinicians must maintain a high index of suspicion for melioidosis in febrile patients with a history of traveling to endemic areas, especially diabetic patients. Melioidosis, an infectious disease caused by Burkholderia pseudomallei, is an important cause of sepsis in tropical areas of Eastern Asia, mainly affecting immunocompromised adults. Diabetes mellitus is the most important host risk factor. Here, the authors report a case of a 54-year-old Saudi male with uncontrolled diabetes mellitus for 10 years who presented to our hospital with a 6-week history of fever, cough, night sweats and weight loss. The patient was a frequent traveler to the Philippines, with his last visit being during the rainy season 2 weeks before the onset of symptoms. Definite diagnosis of melioidosis was not made because of insufficient facility to culture the organism in our laboratory; nevertheless, a diagnosis of melioidosis was made based on the cumulative clinical scenario. The patient was discharged on trimethoprim–sulfamethoxazole and doxycycline for 3 months and showed significant improvement at follow-up. For prompt diagnosis and treatment, clinicians must maintain a high index of suspicion for melioidosis in febrile patients with a history of traveling to endemic areas, especially diabetic patients. This report describes the endoscopic treatment of a biliary leak, following a gunshot injury to the liver of a young Saudi female. She was admitted to the emergency unit having sustained an accidental gunshot on the upper part of her right shoulder when her spouse was maintaining his gun sitting on a higher level chair. She was intubated and immediately taken for exploratory laparotomy, which revealed right liver lobe laceration and significant hemoperitoneum. Bleeding was controlled surgically, and two peritoneal lavage catheters were inserted for drainage. However, about 300–400 ml of bile drainage was observed daily. Accordingly, endoscopic retrograde cholangiopancreatography (ERCP) was performed, which demonstrated a biliary leak. Sphincterotomy was performed and a stent was inserted, following which the biliary leak eventually subsided. A follow-up ERCP was performed 10 weeks later, and no further leak was observed. This is the first case report of a successful endoscopic treatment of traumatic biliary injuries due to a gun shot in Saudi Arabia. ERCP is a valuable method in the treatment of a traumatic bile leak. This report describes the endoscopic treatment of a biliary leak following a gunshot injury in a young Saudi female. She was admitted to the emergency unit having sustained an accidental gunshot on the upper part of her right shoulder when her spouse was maintaining his gun sitting on a higher level chair. She was intubated and immediately taken for exploratory laparotomy, which revealed right liver lobe laceration and significant hemoperitoneum. Bleeding was controlled surgically, and two peritoneal lavage catheters were inserted for drainage. However, about 300–400 ml of bile drainage was observed daily. 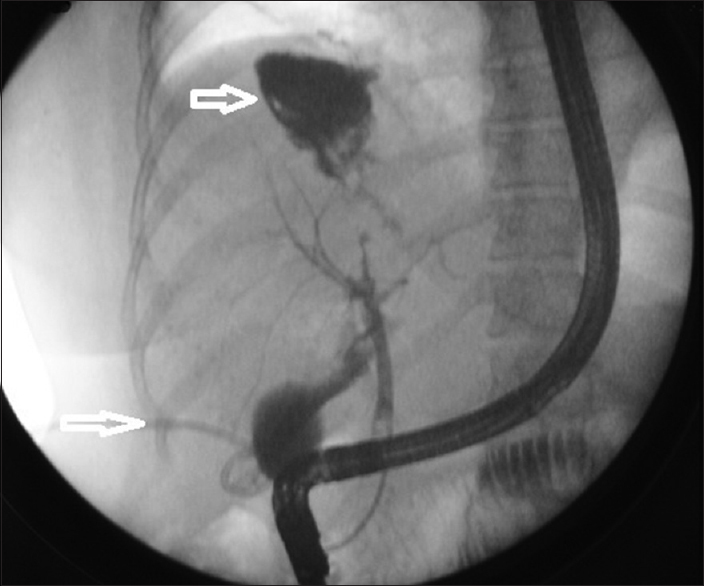 Accordingly, endoscopic retrograde cholangiopancreatography (ERCP) was performed, which demonstrated a biliary leak. Sphincterotomy was performed and a stent was inserted, following which bile drainage gradually reduced, and stopped after 5 days. 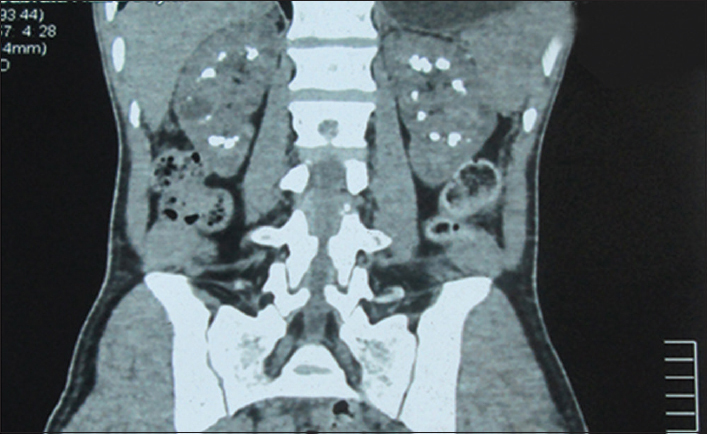 A follow-up ERCP was performed 10 weeks later, and no further leak was observed. This is the first case report of a successful endoscopic treatment of traumatic biliary injury due to a gunshot in Saudi Arabia. ERCP is a valuable method in the treatment of a traumatic bile leak. Parathyroid carcinomas are very uncommon, accounting for 0.1% to 5% of all causes of primary hyperparathyroidism. Parathyroid–jaw tumor syndrome, with a mutation in HRPT2 that encodes parafibromin, is the most common genetic association. Unique features include aggressive clinical course and a lack of preoperative definitive diagnostic criteria. The authors report a case of a 33-year-old male with bilateral nephrocalcinosis, a left-sided neck mass, high calcium, very high parathormone level and a history of parathyroid adenectomy. Computed tomography and 99m-technetium methoxyisobutylisonitrile scan revealed a localized tumor in the left inferior parathyroid region. The patient underwent radical surgery, and histopathology revealed characteristic features of parathyroid carcinoma. Preoperative identification with clinical clues is very important to plan a more radical surgical approach, as both radiotherapy and chemotherapy are ineffective. Recurrence is common and mostly occurs within 2–3 years after surgery. Patient's age, histology and tumor DNA aneuploidy are predictors of survival. Hypercalcemia is controlled with calcimimetics, bisphosphonates and denosumab in inoperable cases. Furthermore, biologic therapy with parafibromin and telomerase inhibitors is under development.